Tianne and Heaven King star in a new Pine-Sol commercial, showcasing the Cleaning Dance Playlist on Pandora. The 15-second spot shows mother-daughter duo star launching a cleaning dance challenge, cleaning up the house while dancing and having fun. The song playing in the commercial is “Intoxicated” by French DJ and record producer Martin Solveig and American electronic duo GTA. 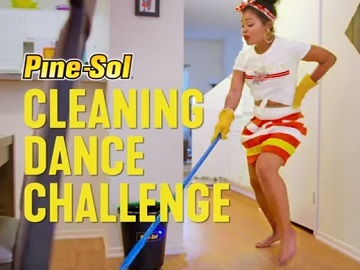 Tianne and Heaven King teamed up with Pine-Sol earlier this year for the dance contest, encouraging participants to post a photo on Instagram of their best cleaning dance move. The Pine-Sol range includes Lemon Fresh, Mango Mandarin Burst, Sparkling Wave, Lavender Clean and Sunshine Meadow.